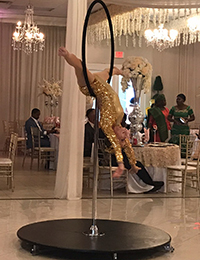 Delight your guests with aerial swing artists who will provide beautiful gymnastics and grace while they swing high above the floor. Or wow your guests with a lollipop display, which can be a free standing apparatus and only needs a 13’ ceiling height clearance. This unique offering is popular for weddings and cocktail receptions. Either of these gifted entertainers are guaranteed to bring stunning and unique talent to your corporate event or private party.